I’ve been hunting leave-in conditioner. Actually, I was hunting Giovanni Direct Leave-in across the Greater Toronto Area and I was having absolutely no luck. Even a friend in Montreal was searching in her local health food store for it. But alas, all that we could find were their wash-out conditioners and shampoos. For a moment, I toyed with the idea of finding another leave-in, but it took me so danged long to find a leave-in that I liked at a price that I liked that I wasn’t too interested in beginning the search again. I started rationing my leave-in. Instead of using a palm full of product on my coily locks to quell the dryness, I was using quarter-sized drops. 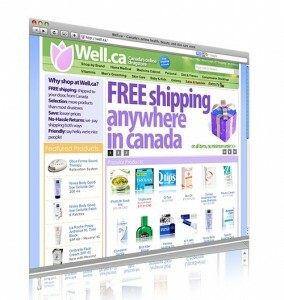 Last week, I stumbled across well.ca, a Canadian-based drugstore that ships free across Canada. And guess what they sell? Giovanni Direct leave-in! Woo hoo! They also sell Neutrogena, Aubrey Organics, Burt’s Bees, Alba, Alaffia, Avalon Organics, Colora Henna, Dr. Bronner’s and more, as well as skin care and household items. I stocked up on my conditioner – I bought two bottles for $10.39 each + GST and PST. My shipping? Nada. Within four days I received my goodies. Yay! So, today, I will sing the praises of well.ca and breathe a sigh of relief that I can find my beloved Giovanni Direct leave-in conditioner without having to sell my future firstborn child for shipping fees.